Did you ever read the story of The Boy Who Cried Wolf? Remember when the young boy tried to trick his village into thinking that a wolf was going to attack the town? And remember when the villagers stopped believing the young boy after they realized that it was a joke? But we all know what happened in the end, right? The wolf eventually came strolling through the town and attacked a flock of sheep when the villagers least expected it. Well, would you believe me if I told you that the Oregon Ducks men’s basketball team finished the regular season in a tie for second place? Or what if I told you that the Ducks possess the Pac-12’s scoring champion, would you believe me? If you haven’t watched a single minute of Oregon Ducks basketball this year, you’re probably thinking I’m crazy right now. But unlike that boy from the story who constantly cried wolf, these high-flying Ducks have been far from a joke this season. The Ducks (23-8, 13-5 Pac-12) finished the regular season with a bang last Wednesday night by coming out victorious against a tough Oregon State team in Corvallis. Of course, Oregon’s victory over the Beavers was significant because the Civil War is always marked on everyone’s calendar, but the Ducks’ triumph also made their NCAA Tournament argument much more compelling. Oregon has won its last five ball games, and since the calendar flipped to 2015, the Ducks have gone 13-5. Joe Young led the Pac-12 in scoring this season, averaging 19.8 points per game. According to TeamRankings.com, Oregon has a 98% chance of qualifying for the NCAA Tournament. It’s amazing to see how much this young team has grown over the last four months, especially because the Pac-12 critics were quick to count Oregon out during their pre-season projections. Could you blame them, though? Oregon lost two of its starters at the end of last year, and only three players on the Ducks’ current roster were scholarship athletes last season. Also, more than 50% of Oregon’s roster is comprised of freshmen, walk-ons and junior college transfers. However, Oregon has completely shattered its preseason expectations and the men in green and yellow are on the brink of a third straight March Madness appearance. But in my opinion, though, the Ducks would have never made it this far it wasn’t for the two most important pieces of the operation: Dana Altman and Joseph Young. 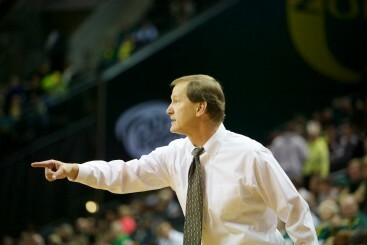 Dana Altman won the Pac-12 coach of the year award for the second time in the last three years. Altman was named the Pac-12 Coach of the Year for the second time in the last three years on Monday morning. The longtime coach has an uncanny ability to lead young men and it’s been evident on game nights and during practices, as well. When he speaks, his players listen. And when he believes, his players believe, too. Altman understood the situation that the program was facing before the year started, but he never complained. He mentioned a few weeks ago that he expected his team to struggle this season. He understood that he had a very young roster, and he was expecting the team to go through some growing pains. When he was asked how his team has been able to overcome so much, Altman simply answered with one word: belief. The Ducks are still standing because they have never stopped believing in themselves, and it’s been a direct correlation of Altman’s vision. Also, with all due respect, no other player in the conference was more vital to his team’s success than the high-scoring guard out of Houston, Texas. Young, who was named the Pac-12 Player of the Year on Monday morning, took his game to incredible heights this season. Not only did he lead the conference in scoring, but his overall play on the defensive end, and his ability to get his teammates involved drastically improved. If it wasn’t for Young’s leadership and his overall greatness on the basketball court, the Ducks wouldn’t be tied for second place right now. I’ve been watching this program very closely for the last three years, but I can honestly say that this has been the most exciting season that I’ve witnessed so far. Think about it. The Ducks aren’t supposed to be in the position that they’re in right now; they’ve been the underdogs all year. Oregon never accepted failure, though. 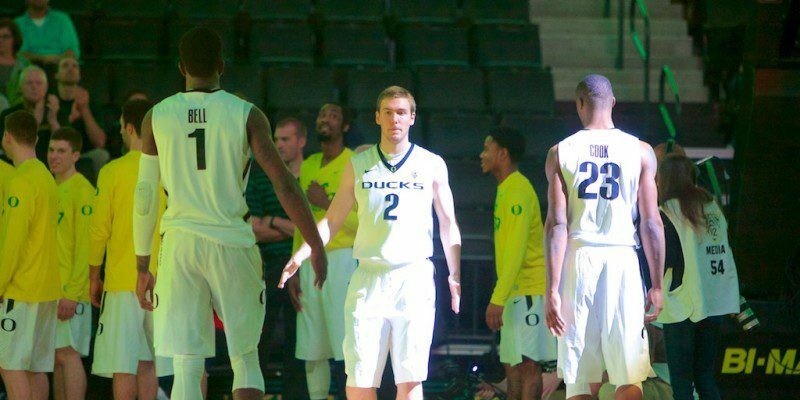 These high-flying Ducks have had a chip on their shoulder all season long, and as they prepare for the Pac-12 Tournament and, possibly, the NCAA Tournament, only one question comes to mind: how far can these young Ducks go?